Missouri Grass Fed Beef is committed to the land and to our animals. To keep our land healthy and productive, we utilize a rotational grazing system. This insures that our cattle are taking in the highest quality protein and minerals and clear, high-quality water from numerous creeks and springs in the Ozark highlands. The beef we sell has been born and raised on the same farm from start to finish. They are processed at about 1 year of age, which results in the leanest, most tender grass-fed beef available. They have never been fed any grain or animal by-products (standard practice at commercial feedlots). In the winter, we feed stockpiled fescue and hay that we grow and harvest ourselves from our farm. The rest of the year, we graze pastures which may contain fescue, orchard grass, timothy, red clover, white clover, yellow clover, lespedeza, switch grass, eastern gamma grass, big blue stem and many other types of perennials. Therefore, our animals have only had these natural forage plants, mother's milk, and free choice minerals. We currently have a herd of mixed beef cows, with Angus and Hereford making up the majority. We also have a few Braunvieh and Charlois, and several Angus/Hereford crosses. 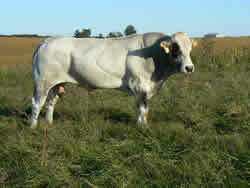 The bulls that we currently have are a registered Piedmontese (shown left) and a registered Beefmaster. We forbid any growth hormones, steroids, or antibiotics to be given to our cattle, so our customers can be assured of receiving pure, healthy beef the way nature intended. As a result, the animals grow at a natural pace. For these reasons and more, grass-fed animals live low-stress lives and are healthy.